Visitors see the center piece and the jewel of Cherveux being drawn in front of them when they arrive at the castle from the village. It is a superb dungeon with its "angles redans", its carved machicolations and its richly decorated attic window of birds, angels and foliage. Just after the bridge, beside the porch, in a more recent construction which was used in the past to accommodate the soldiers, you will find guestrooms. Through sieges and wars, heavy destruction was caused and the biggest part of the wall disappeared for ever. In the irregular pentagonal court yard, we can see a round roofless tower. Imposing but elegant, partly medieval and partly Renaissance, this freestone construction is a bright testimony to its builders richness and sense of tactics. Its angles were intended to protect the windows and the defenders, as with the recent use of firearms, the structure of the military buildings had to be modified. 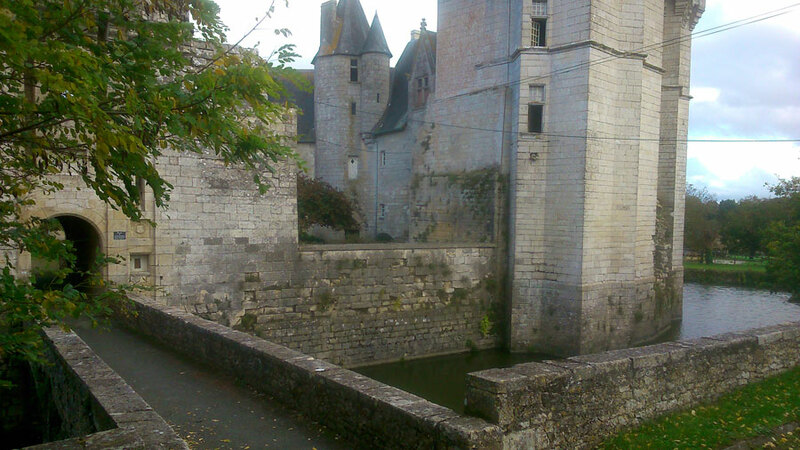 Nowadays, the castle is surrounded with wide moats and a strong wall. In the North West angleCour intérieure du château, a sturdy, roofless tower reminds us of the first feudal construction that used to stand there until the 15th century. On the right, adjoining the dungeon, stands the dwelling. two high hexagonal staircase towers and flamboyant gothic sculptures light the facade up.